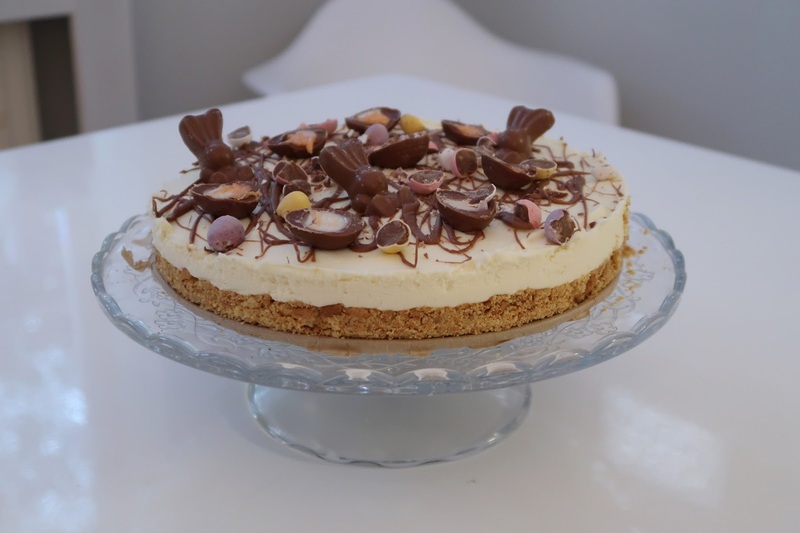 Now I don’t know about you but I love a cheesecake and when my friend Zoe made us a white chocolate cheesecake one day for pudding I was hooked!! For me Easter is all about the chocolate. It’s a time for eating too much of it and quite frankly if it does not come adorned with Cadbury Creme Eggs and Mini Eggs I simply do not want to know! 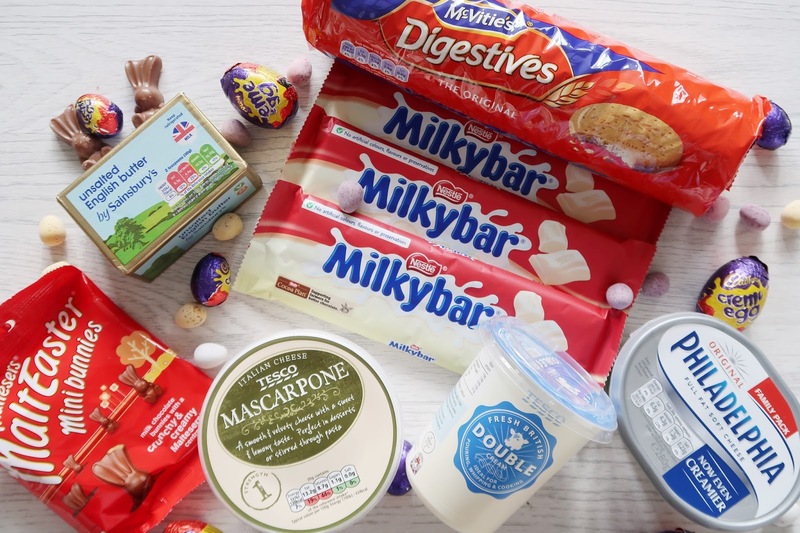 One top tip is to purchase Mini Eggs and Creme Eggs when you see them regardless how long it is till Easter. Every single year for the last goodness knows how long I have gone in search of these Easter weekend and failed so stock up when you can!! This recipe is simply the easiest ever white chocolate cheesecake. And it’s also not just for Easter. We’ve had it topped with fruit and simply on its own. It’s very sweet so if you are more partial to a slice of Brie than you are cheesecake step away now – equally so if you are trying to lose weight you won’t want to read on!! 1. Start by turning your digestive biscuits into fine crumbs. You can use a food processor for speed but I popped mine in a large sandwich bag and gave it a jolly good battering using a rolling pin. 2. Place the butter in a saucepan and melt. 4. Tip the biscuit crumbs into a bowl, add the melted butter and mix. 5. Tip the crumb mixture into the tin, level and press down with the back of a spoon. 6. Pop into the fridge for 30 minutes. 7. Meanwhile let’s get on with the good stuff. Break up your white chocolate and place in a heat resistant bowl over a pan of simmering water. Make sure that the water does not touch the bowl and once the chocolate starts to melt give it a mix and take off the heat until it has all melted. Set aside to cool for 5 -10 minutes. 8. Now using a spoon or electric whisk, whisk the mascarpone and cream cheese together until smooth. Now add the double cream and whisk away for 30 seconds or until just combined. 9. Add your melted chocolate. 10. Whisk for a further 30 or so seconds. 11. Empty the chocolate cheesecake mix onto the top of your biscuit base and level out and place in the fridge for as long as possible. Feel free to lick the bowl and spoon at this point! 12. Once the cheesecake has hardened up (it will still be relatively soft to the touch) its now time to decorate. I used a selection of Mini Eggs, Creme Eggs, Malteserbunnies and melted chocolate but you can decorate it as much or as little as you like. 13. Once ready to serve remove the outer rim of the spring release tin and transfer to a plate or cake stand. 14. Cut yourself a massive slice and enjoy every mouthful! Happy cheesecaking! I would love to see some of your cheesecake creations!